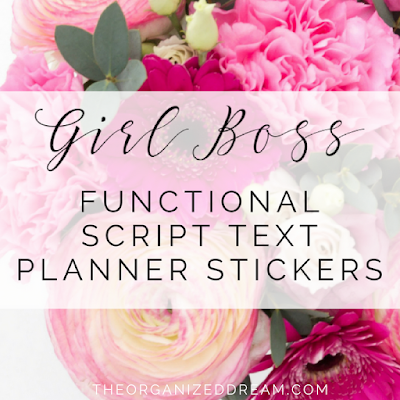 If you're a girl boss then you probably have a lot going on in your day-to-day business life. Am I right? As a blogger who treats her blog as a business and someone who runs her own shop I can tell you that more often than not, I have something to do. My latest additions to the shop are specifically made for girl bosses! There are three new script text planner stickers to choose from this week and more to come soon! Whether you want to mark a meeting, mark an event or task cancelled or just start a work-related to-do list in a pretty way, these stickers are sure to help out in more ways than one. They're functional and designed for ladies who like getting down to business in style. This pretty script font features hearts at either end of the words to add a feminine touch and will work with any planner including a bullet journal, traveler's notebook or a standard planner. You'll find links to each listing below the image. You can also check out more in our Etsy Shop! We have more script text icons to choose from as well as functional and decorative stickers for everyday life.